Newton's Nook Designs: Holiday Release - Day 2 - Canine Christmas! Day Two and another fun reveal day for October! Today we are featuring the set Canine Christmas! We are giving this set away to two lucky winners so make sure you read all the way to the bottom of this posting to see how to win! I had lots of requests for puppies so I hope everyone loves this set! 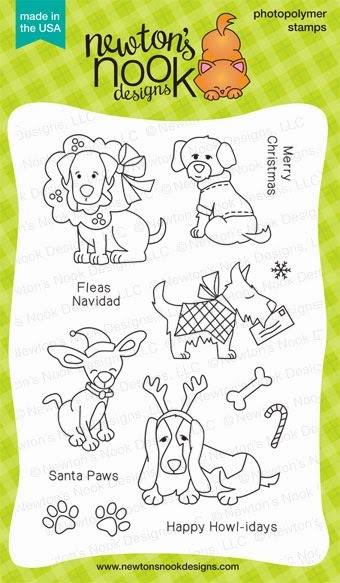 I had so much fun drawing these dogs and making them all decked out for the holidays! This one is dedicated to all the dog lovers out there! Here's what our Design Team created with this set! Make sure to click through to all their blogs for details on their cards and make sure to comment for a chance to win! Details on the giveaway are at the bottom of today's post. First up, a couple of cards from our October Guest Designers! 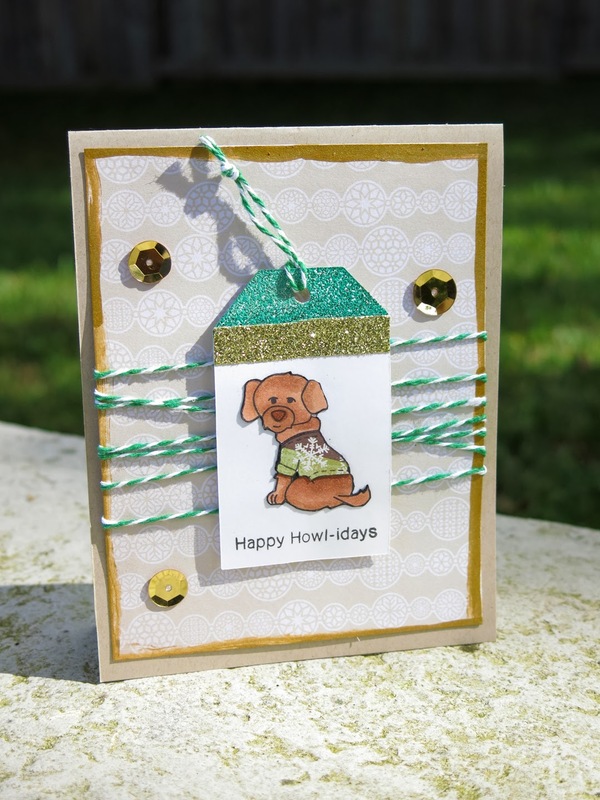 Our October Guest Designer, Alice Wertz, created this cute doggie gift tag! Her coloring is so gorgeous and this tag is adorable! October Guest Designer, Danielle Pandeline created this sweet card using the little dog in the sweater! Love the sparkle and the paper piercing on the sweater! Next, more inspiration from our Design Team! 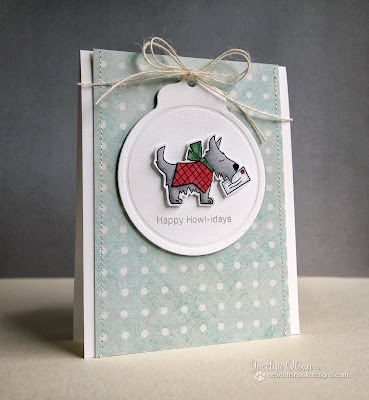 First up is this fun puppy card by Jennifer Ingle. Isn't it cute how she colored his jacket and added snowflakes all over the sky? 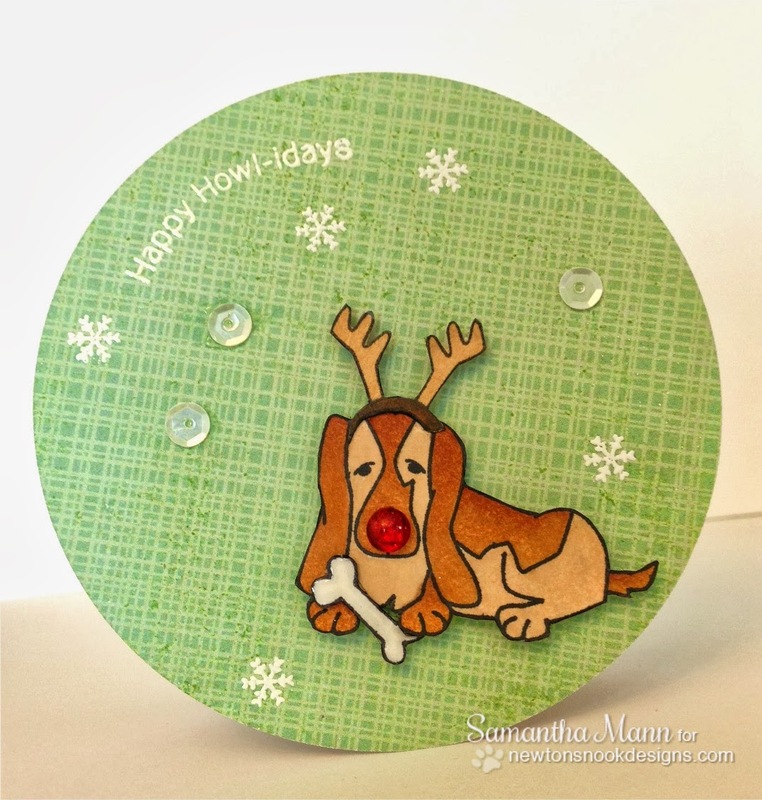 Samantha Mann made this cute circle card with the basset puppy! She even gave him a rudolph nose! Check out her blog today for another cute card using this set! 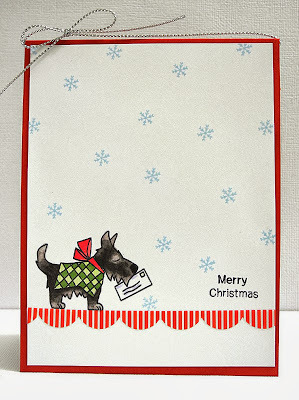 Tessa Wise created this adorable card - do you think that doggie is mailing his letter to Santa? 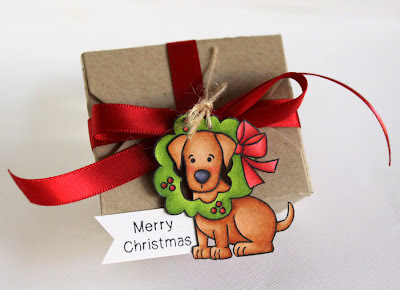 Jocelyn Olson used the same puppy image but she put him inside a Christmas ornament! I love this idea! Would you like to win Canine Christmas? 1. Comment on Newton's Nook Design blog: http://www.newtonsnookblog.com. One Winner will be randomly chosen from the comments on the Holiday release posts. 2. Comment on the Design Team Member and Guest blogs (see list below)! One winner will be chosen at random from the collective blogs in the Holiday release blog hop. Make sure to check out each of their blogs and comment for your chance to win. You will not know which blog has been chosen so the more you comment on the better your chances are of winning! You have until Thursday, October 17th at 9 pm Central Standard Time to comment -- winners will be announced on the blog post on Friday, October 18th. 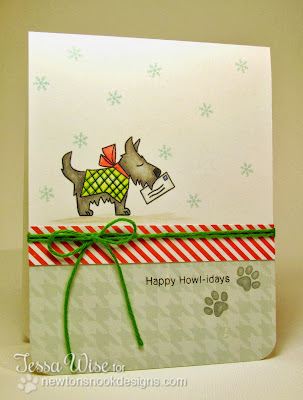 Don't forget to come back tomorrow and see and enter to win our second release, Canine Christmas! Love your Christmas pups--PAWS for celebrating... cute set! I'm totally in love with all the dogs - too adorable! YAAY! YAAY!! YAAY!! I am WICKED PSYCHED this set is coming out! Our furbaby gives treats to him neighborhood doggie friends (and his Mommy makes them, LOL!) and this set will be PERFECT to adorn the little gift packaging and tags and make ADORABLE holiday cards for our dog-loving friends (and we have a TON of those, being the HUGE dog lover I am). Thank you so much for creating this set! I love all of these little pups. I can't wait to order this set! Not only is this set beyond adorable, but I LOVE the comments from others who, like me, are dog-lovers! These are over-the-moon darling, and the DT have worked magic with showcasing them! Perfect to make cards for fellow dog-lovers, rescue shelters and just anybody and everybody! Brilliant set; perfect match for Newton! Too cute!!! Your sets are so perfect for my CAS cards! Fabulous cards!! Love this set!! What a cute set! I love that little Scottie dog. Great design team inspiration, too! These are adorable jen :) Perfect for Christmas and all of the dogs are super cute...I can't wait to use this!!! More of a feline follower, but these little puppies would be so cute for the dog lovers in my life! So cute! Oh my, I love these doggies!! All of the dogs on this set are so cute. I just wish you had a Frenchie or a Boston in there too! Oh my gawrsh...too cute! Love these pups and the "fleas navidad"! Oh how cute . Puppies to hang out with the kitties. Again WONDERFUL creations everyone. TFS. OMG - you guys are so awesome with these wonderful animal sets. Can't wait to see the rest of the collection. The dogs are darling. Bear will approve of my purchase of this set of stamps. Love all of these sweet cards! Another great set. these pups are absolutely adorable! I really like the cards made by all and would love to win any of your new sets, they are all FAB!!!! OMG... These dogs are too stinking cute!!!! Heee these little doggies are adorable! I totally LOVE this set!!! Especially the basset hound, always wanted one of them :-) Super cute samples!! Wow I have just stumbled upon your blog and I absolutely love your cute designs.